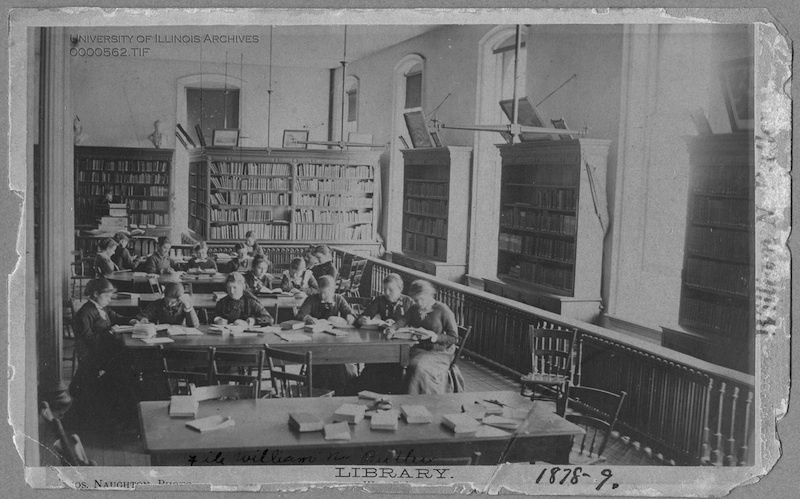 The University Library was founded with the charter that established the Illinois Industrial University in 1867. The Board of Trustees designated $1,000 to purchase 644 books to start the library. These books were first housed in the office of Regent Gregory, who also served as the University Librarian. When the University officially opened in 1868 the collection had grown to 1,039 volumes. In 1869, Henry Marshall Douglass was elected the first official University Librarian, and served until 1871. In 1874 construction of University Hall was finished and the library collection was transported by wheelbarrow from Regent Gregory’s office to the new location. During the time when the library was held in University Hall, there was no official appointed Librarian; faculty members served as librarians until 1894 when Percy Bicknell, who had library experience, was appointed full-time Librarian. 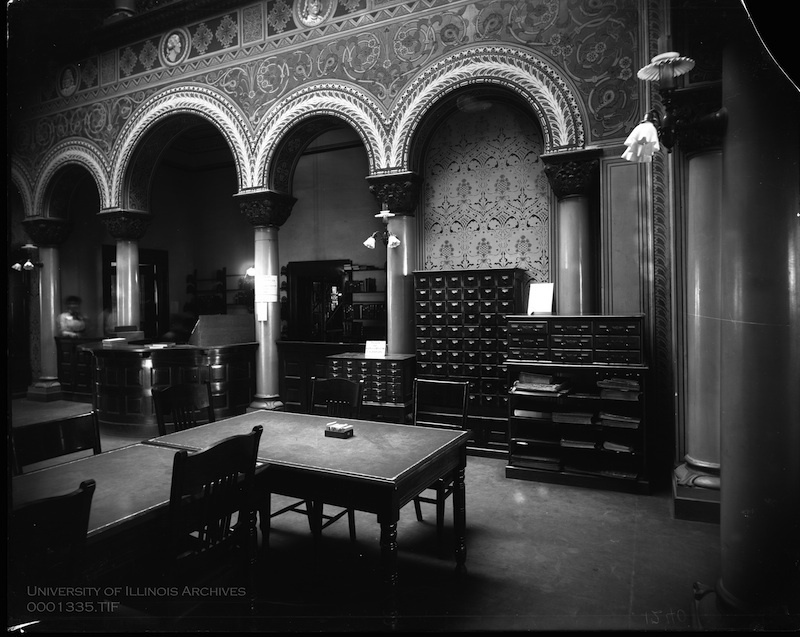 In 1897 the Library Building, which was later named Altgeld Hall, was completed and the collection moved to its third, but not final, home. This same year Katherine Sharp was named Librarian and Director of the Library School, which was then located in the Library Building. Sharp developed reference services and professionalized cataloging practices, thereby ‘modernizing’ the library. The library collection would be housed here for almost thirty years. In 1912, then President Edmund James went on record at the June 7th Board of Trustees meeting saying the “University should look forward to the accumulation of a collection of at least a million of books as rapidly as it at all possible…" President James proposed either a new addition to the current library or to build a new library which could be constructed in sections at a time. The University opted for the latter of the two options. It would not be until 1923 when ground was broken for the new Main Library. 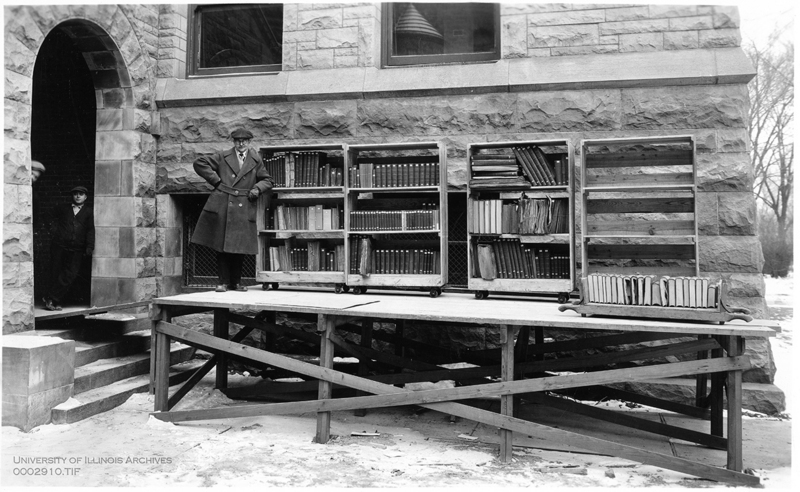 In 1926 the Main Library was dedicated and plans are already underway to add another addition to the stacks, which was completed in 1929. 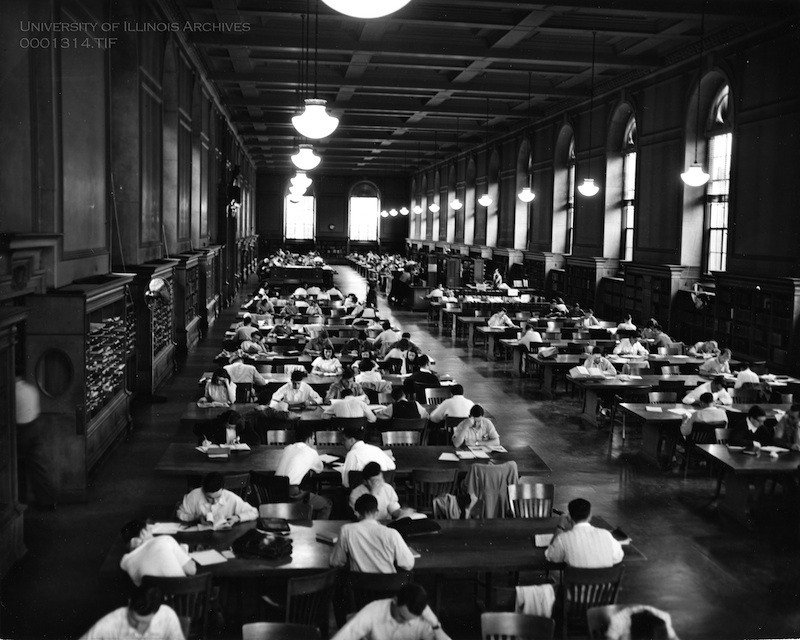 In 1927 the University of Illinois library was sixth in rankings for number of volumes, up from twelfth when President James proposed a new library, and in 1935 the library acquired its one-millionth volume. Between 1940 and 1984 four more stack additions were built onto the existing library building, making five total stack additions since the library’s dedication. During those years the library grew at a rapid rate, in 1942 the two millionth volume was acquired, with another million volumes acquired almost every ten years until the six millionth volume was acquired in 1982. The 1970s were an exciting time for the University Library. By 1971 the University of Illinois was ranked third largest in the United States, and in 1978 the Library Computer System (LCS) was created. It included programs for shelf-lists and circulation. This would be a more efficient method than using the card catalog, and therefore the following year the card catalog was discontinued. Since the last stack addition to the Main Library, the collection continued to grow at a rapid rate, between 1986 and 2010 an additional six million volumes were acquired putting the total at 12 million by the end of 2010. In 2012, the library acquired its 13 millionth volume. The University Library system is currently ranked 5th largest library in the US overall, and 2nd largest academic library. In 1994 the Grainger Engineering Library was dedicated, in 2001 the Agriculture, Consumer & Environmental Sciences Library (ACES) was dedicated, and in 2003 the Oak Street high-density storage was opened to accommodate the ever expanding library system. There are now approximately 41 physical libraries on campus and more than 5 full digital libraries. In the Fall of 2013, the University Library welcomed its fifteenth Dean of Libraries, John P. Wilkin. 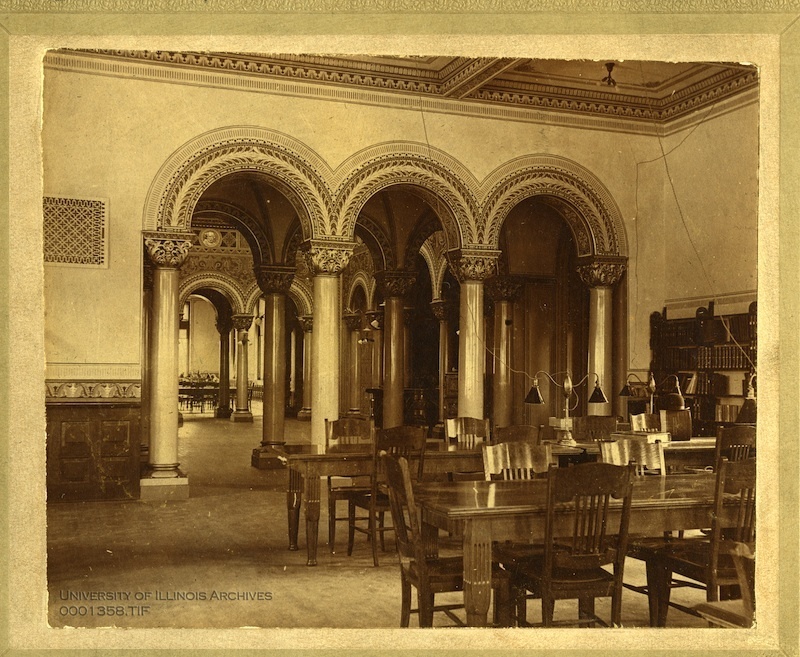 Altgeld Hall Library Card Catalogue, circa 1900: Photograph of the card catalog area at Altgeld Hall during the time when it served as the University Library. Image courtesy of the University of Illinois Archives. 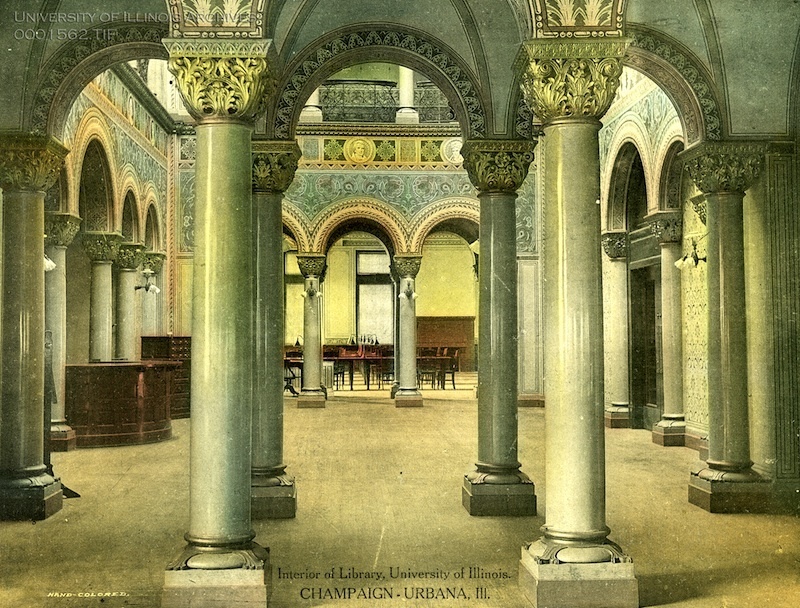 Library Interior, circa 1910: Colorized postcard of the Altgeld Hall's interior when it served as the University Library. Image courtesy of the University of Illinois Archives. 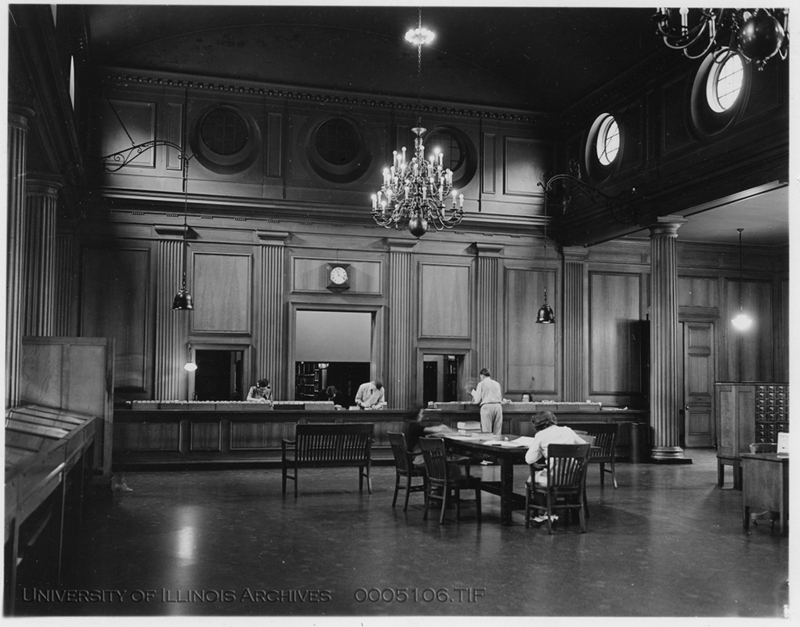 Library Main Reference Room, circa 1960: Students studying in the Main Library's second floor reference room. The windows on the right side feature stained glass printer's marks. Image courtesy of the University of Illinois Archives. University Hall Library, 1878: This photo was taken when the library was part of University Hall, also known as the Elephant Building. This building was demolished in 1881. Image courtesy of the University of Illinois Archives. 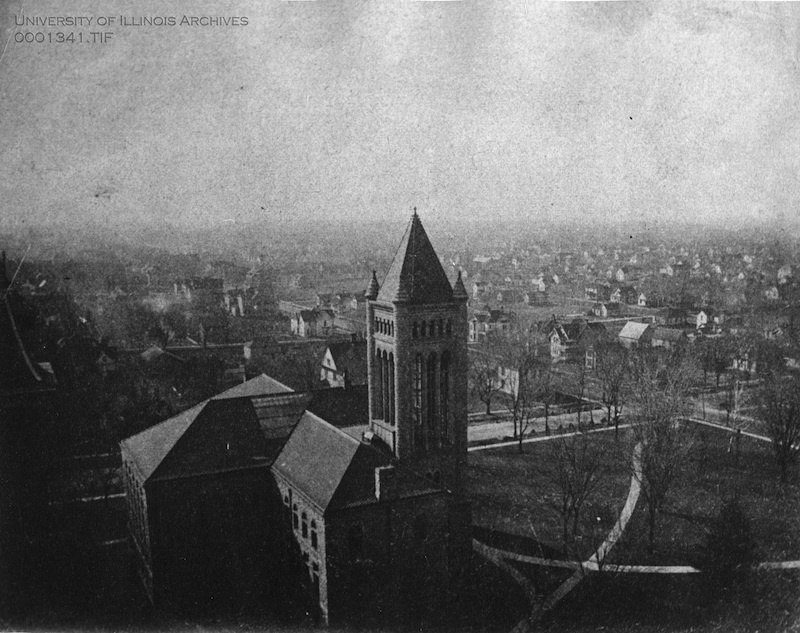 Altgeld Hall (Library Building) Aerial View, 1901: Image courtesy of the University of Illinois Archives. Altgeld Hall Study Room, circa 1910: Looking out through a study room into the Reception Hall of Altgeld Hall when it was the Library Building. Image and text courtesy of the University of Illinois Archives. 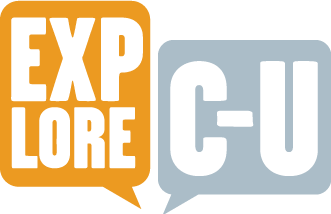 Kara Brehm, “University of Illinois Library System and the Main Library,” ExploreCU, accessed April 22, 2019, https://explorecu.org/items/show/251.